Applications are invited from the suitable candidates having qualifications and experience in the relevant fields as mentioned below against the posts on purely contract basis. 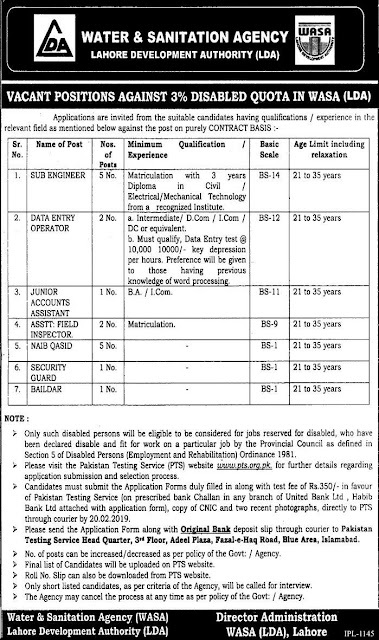 WASA Latest Jobs February 2019. Vacant positions against 3% disable quota in WASA (LDA). All these jobs are the government. If you have any questions, you can do the comments under this article regarding all of these jobs. Matriculation with 3-year Diploma in Civil, Electrical, Mechanical Technology from a recognized institute.or BA, Intermediate, D.com, I.com, DC or equivalent. How to apply WASA jobs 2019? Please visit the Pakistan Testing Service (PTS) website www.pts.org.ok for future details regarding application submission and testing process. candidates must submit the application form duly filled in along with test fee of Rs, 350/- in favor of Pakistan testing service on prescribed bank challan in any branch of United Bank Ltd, or Habib Bank attaches with applications form, a copy of CNIC and two recent photographs, directly to PTS thorough courier. The final list of Candidates will be uploaded on the PTS Website.